A Sydney-based cross laminated timber (CLT) specialist has recently completed its first residential project using the material. Cameron Grimes takes a look at some of the advantages CLT may bring to the building industry. Cross laminated timber (CLT) is still a relatively new product for the construction industry, but is slowly developing as a popular alternative to traditional building materials. Developed in Austria and Germany in the 1990s, CLT is created by stacking kiln-dried timber boards and gluing the surfaces together with adhesive. From there, the boards are hydraulically pressed for several hours to develop solid structural wood panels, which can then be used in the construction of flooring, roofing and walls. Like other building materials, CLT can be used for low-rise to high-rise residential, commercial, retail and industrial buildings. The material has seen a significant rise in popularity in the building of educational facilities in Europe. The growing popularity of CLT has resulted in its implementation in major construction projects. In Australia, one such project has been recently completed. Sydney-based CLT solutions developer Holz DC has recently completed its first residential project involving the use of the material; a boutique apartment complex in Shellharbour, Illawara. The project is the first residential apartment building completed with CLT in New South Wales. Six one-and two-bedroom apartments were constructed out of the new material, with the CLT panels being installed using cranes to form the overall structure of the building. Working with construction company Hyperbuild, over 350 of Holz DC’s CLT panels were installed, with the project completed in just 15 days. So what exactly are the benefits of CLT compared to traditional building materials? Holz DC director of construction Theo Pasialis shares the company’s experiences with CLT and how he believes it benefits the building sector. “Using CLT is a completely different experience than that of traditionally constructed buildings in Australia,” Theo says. CLT is also the only carbon-positive structural material compared to others such as concrete and steel, with less CO2 expended through the manufacturing, delivery and installation of the material than absorbed in a tree’s lifetime. Timber is obviously nothing new to the building sector, but CLT’s benefits over traditional materials lie within its production. In the production phase of CLT, architects and builders can order precision manufactured components to avoid any material going to waste. “The pre-manufacturing of CLT minimises the number of people required on site during construction and produces significantly less on-site waste, which equates to considerable safety and environmental advantages during the building phase,” Theo says. According to Holz DC, CLT provides up to 10% more living space than other construction materials, due to the thinner nature of the material. As a result, CLT is also significantly lighter. Coupled with the flexible prefabrication options on offer, Theo says this strongly contributed to the quick completion of the residential project. “The project actually went very smoothly due to a strong focus on planning at every stage,” he says. “This allowed us to complete the project five days ahead of the build schedule for a total erection time of only 15 days. The installation was meticulously thought out prior to delivery and the installation crew were able to work extremely efficiently. Though it requires more raw materials in its production, resulting in a higher cost, CLT can be more cost efficient over its rival materials due to less time required on site during installation. 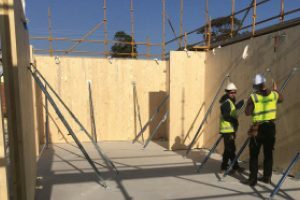 “CLT is generally more cost effective than structural steel or concrete, and vastly outperforms conventional framed construction materials for air tightness, thermal insulation, internal moisture management, acoustic insulation and fire resistance. While its availability in Australia is still in its early stages, Theo has no doubt CLT will be the way forward for the building sector. “CLT has been cited as the 21st century solution to building sustainability,” he says.